It is imperative that every educational institution, in this world of precipitate technological advancement, take on the challenge of developing a TEL framework—and in so doing, the institution will be better positioned to address the plethora of TEL challenges more effectively. The diagram below presents some key generic questions at each level of the framework. without sufficient CPD, learner success in the TEL environment cannot be ‘achieved’ effectively (see section 2.3 for more discussion on CPD). Learner success above is defined loosely as meaning evidence of improved engagement, satisfaction, success and retention in the TEL environment, (see section 2.4 for more discussion on the learner). In this paper, in section one, I will discuss how I see Technology Enhanced Learning in the modern technology-addicted world. Then, in section two, I will describe the four elements of my 'hierarchy-of-needs'-style TEL framework in more detail. In section three, some feedback and documentation issues will be analysed. Finally, in section four, I will suggest, based on the framework, a logical layout for a TEL Centre webpage. The pace with which new educational technology software and hardware have been being thrust upon the unsuspecting humanware (i.e. the ‘human’ student and the ‘human’ teacher) in recent years, for me is significantly more alarming than astounding. We now may actually be witnessing the gradual usurpation of the human teacher from a well-established and successful historical role; moreover, it is likely that this attempted take-over process will only speed up if educational AI technologies get ‘really smart’ and inexpensive to scale. However—and scary stuff aside—the real challenge to understanding TEL should not be about the role of the teacher per se, essentially, it should lie in the way the real needs of the unpredictable humanware are fused to the capabilities of appropriate learning technologies. And why the humanware rejects some technologies for me is far more interesting than why it accepts them. What’s more, in an environment of rapid technological change and increasing competition, it’s imperative to always be analysing how humanware idiosyncrasies might affect technology uptake. Consequently, TEL is a particularly complex discipline requiring a critical, well-informed, principled and ‘humanistic’ approach to the implementation of learning technologies. 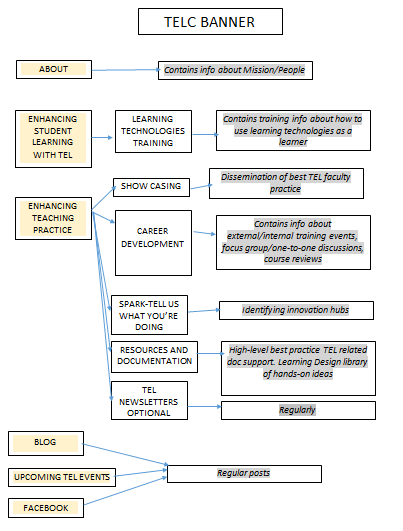 At the heart of TEL is a practicable framework, which provides an essential foundation for understanding its multifaceted nature, and on which to base grounded TEL strategies clearly. Does the institution understand the TEL issues? Does it have a vision for TEL? Is there buy-in and support for TEL? In an environment where the viability of most educational institutions today increasingly is predicated on being able to adapt to learning technologies quickly and appropriately, the bedrock assumption of the framework, therefore, is that institutional decision-makers will be able to understand the key issues at hand. Furthermore, not having adequate institutional support at all subsequent levels of the framework will lead to (or exacerbate) resistance to change—and this, in particular, is evident at the crucial continuous professional development (CPD) stage where higher levels of demotivation, cynicism or rejection may become an insurmountable challenge to pushing TEL innovations forward. Therefore, it is critical to create professional development incentives for faculty—and this needs to be done within an organisational structure that recognises and encourages faculty TEL successes. Moreover, it should be understood that in (to-be) cutting-edge organisations, the skilling-up process is continuous with no opt-out option. 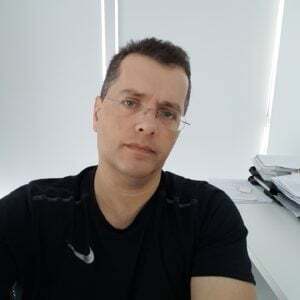 Therefore, in this technological age of disruption and revolution, the institutional stakeholders need to be and remain open to the concept of unceasing change. Therefore, one of the most important goals of TEL, at the institutional stakeholder level, is to raise awareness of its challenges and successes. Therefore, it is vital to determine whether the institution actually has a vision about the role of TEL, and if so, to assess how well informed it is. Key Framework Issue: Is TEL horizon scanning and research into best TEL use taking place? With a view to enhancing CPD and to improving the TEL environment, logic demands that tier two of the framework should comprise horizon scanning the rapidly evolving learning technologies’ market and researching the best use of existing learning technologies. Key Framework Issues: Are teachers confident to design, reflect, experiment and share best practice? The aim of CPD—in a conducive well-supported institutional environment—is to improve digital literacies in a way that leads to faculty becoming (more) confident to design, reflect, experiment and share best practice. Therefore, TEL training is about discovering pockets of contextualized instructor bottom-up success and disseminating or showcasing it—also, it is felt that there is no one ‘correct way’ for all in TEL. Therefore, TEL training aims to showcase faculty passionate about their innovations; faculty, or rather the ‘passion’ that faculty may have, can be a powerful driver for change in an organisation. Therefore, TEL training intends to enhance the learning environment in a way that is underpinned by sound Learning Design principles and technological innovation. having realistic TEL targets, because the sheer choice of learning technologies available can be extremely overwhelming, and this might lead to loss of interest, demotivation, rejection, scepticism or even burnout. Key Framework Issues: Is there evidence of improved engagement, satisfaction, success and retention in the TEL environment? 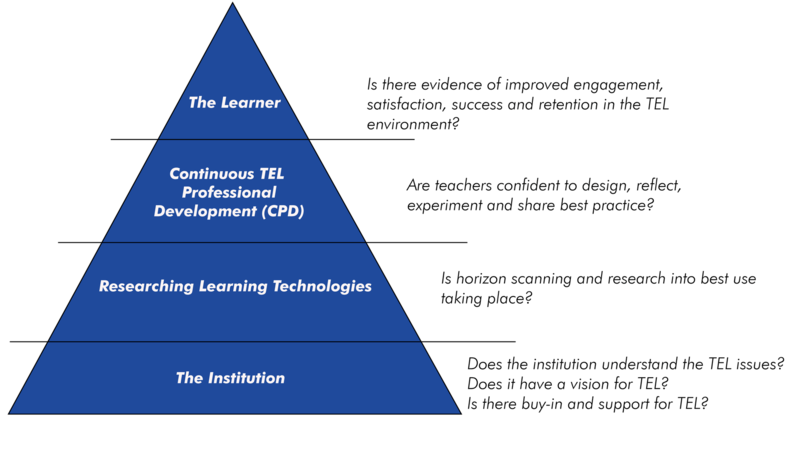 At the top of the pyramidal TEL framework is the all-important learner: it is held that evidence of improved engagement, satisfaction, success and retention in the TEL environment is an outcome of improving approaches to the preceding three prerequisite framework levels. At this stage, feedback is elicited regularly in multiple ways (NB feedback is also discussed in section three). addressing in online courses any bias towards student-to-content interactivity with a thoughtful incorporation of better-balanced student-to-student and student-to-teacher interactivity (NB this issue is also discussed briefly in my paper here). Feedback through various data collection methods is critical for making the framework responsive to the specific needs of the organisation (i.e. learners, teachers, stakeholders). to evaluate stakeholder perspectives on TEL issues and challenges. dynamic adaptive, personalised and intervention based ML analyses. With regard to documentation, the aim is to integrate TEL within the institution. Therefore, this is done by developing and disseminating TEL policies and guidelines. A TEL webpage should be based (commonsensically) on a framework: it therefore especially needs to have a training component focus (ie not only for faculty, but for the learner too), and a dissemination of information/documentation component focus (e.g. blog, newsletter, Facebook, web pages). I have come to realise that TEL tends to become a hybrid discipline that requires one to know how to ‘speak’ the language of IT and to know how to ‘speak’ the language of education. Yet both camps—IT and educationalists—on the whole, need to be approached very differently, and that I guess is a true bottom-line challenge in TEL.